Johannes Kepler estimated the distance to the Sun as 14 million miles. E. Stephan discovered asteroid #89 Julia. J. C. Watson discovered asteroid #115 Thyra. K. Reinmuth discovered asteroid #998 Bodea. Jonathan Bruce Postel (6 August 1943 - 16 October 1998) made many significant contributions to Internet standards. He is principally known for being the Editor of the RFC document series from the IETF; he also initiated and ran the number assignment clearinghouse, the IANA, from its inception to his death. He wrote and edited many important RFC's, including RFC's 0791-0793, which define the basic protocols of the Internet protocol suite, and RFC 2223 (Instructions to RFC Authors). An atomic bomb codenamed Little Boy was dropped from the American B-29 bomber Enola Gay on the Japanese city of Hiroshima, the first known use of atomic weapons in human warfare. USSR launched Vostok 2 (also called Sputnik 12, call sign Oryel/Eagle), piloted by cosmonaut Gherman Titov, who became the second human to orbit Earth, and the first to stay in space over 24 hours. Vostok 2, the second spacecraft in the USSR's manned flight series and launched 6 August 1961, was piloted by cosmonaut Gherman S. Titov (call sign Oryel - "Eagle"), who had the misfortune of being the first reported case of motion sickness in space. The spacecraft carried life-support equipment, radio and television for monitoring the condition of the cosmonaut, tape recorder, telemetry system, biological experiments, and automatic and manual control equipment. The flight's objectives were investigation of the effects on the human organism of a prolonged flight in orbit and subsequent return to the surface of the Earth, and investigation of man's ability to work during a prolonged period of weightlessness. Biomedical experiments were performed, and motion pictures of Earth were obtained during the flight. Titov took manual control of spacecraft but suffered from space sickness. He also had a professional quality Konvas movie camera, with which ten minutes of film of the Earth were taken through the porthole. Both television and film images were taken of the interior of the spacecraft. Like Gagarin, Titov experienced problems with separation of the service module after retrofire. The spacecraft consisted of a nearly spherical cabin covered with ablative material. There were three small portholes and external radio antennas. Radios, a life support system, instrumentation, and an ejection seat were contained in the manned cabin. The cabin was attached to a service module that carried chemical batteries, orientation rockets, the main retro system, and added support equipment for the total system. The service module separated from the manned cabin on reentry. Vostok 2 made 17 orbits of the Earth in 25 hours, and landed on 7 August 1961 near Krasny Kut, Saratov. Titov made a separate parachute landing after riding his ejection seat out of the capsule. Titov was never to fly again, after being assigned to the Spiral spaceplane, which turned out to be a dead-end project. A biography of him by Martin Caidin, "I Am Eagle," made him somewhat more accessible than Gagarin to the West. USSR's Zond 2 passed Mars at a distance of 1500 km and a relative speed of 5.62 km/s; communications had been lost in early May. Zond 2, launched 30 November 1964, was an automatic interplanetary spacecraft launched from a Tyazheliy Sputnik (64-078A) in Earth parking orbit towards Mars to test space-borne systems and to carry out scientific investigations. The probe carried a descent craft and the same instruments as the Mars 1 flyby spacecraft: A magnetometer probe, television photographic equipment, a spectroreflectometer, radiation sensors (gas-discharge and scintillation counters), a spectrograph to study ozone absorption bands, and a micrometeoroid instrument. Zond 2 had six experimental low thrust electrojet plasma ion engines for attitude control that could be used instead of the gas engines to maintain orientation. Power was provided by two solar panels. The flight took a long, low energy trajectory towards Mars. The ion engines were successfully tested shortly after launch under real space environment conditions, over the period December 8-18, 1964. One of the two solar panels failed so only half the anticipated power was available to the spacecraft. After a mid-course maneuver, communications with the spacecraft were lost early in May 1965. Zond 2 flew past Mars on 6 August 1965, at a distance of 1500 km and a relative speed of 5.62 km/s. NASA and the USAF launched X-15A IR Scan,Stability Test mission # 142 in which Milt Thompson achieved a maximum speed of 5687 kph (Mach 5.15), and attained a maximum altitude of 31.455 km. NASA's Lunar Orbiter 5 took its first picture of the Moon, from Lunar orbit. Lunar Orbiter 5, the last of the Lunar Orbiter series, launched 1 August 1967, was designed to take additional Apollo and Surveyor landing site photographs, and to take broad survey images of unphotographed parts of the Moon's far side. It was also equipped to collect selenodetic, radiation intensity, and micrometeoroid impact data, and was used to evaluate the Manned Space Flight Network tracking stations and Apollo Orbit Determination Program. The Deep Space Net Tracking Station at Woomera, Australia, acquired the spacecraft about 50 minutes after liftoff. Signals indicated that all systems were performing normally and that temperatures were within acceptable limits. The spacecraft was placed in a cislunar trajectory, and on 5 August 1967 was injected into an elliptical near polar Lunar orbit 194.5 km x 6023 km with an inclination of 85 degrees and a period of 8 hours 30 minutes. On 7 August, the perilune was lowered to 100 km, and on 9 August the orbit was lowered to 99 km x 1499 km with a 3 hour 11 minute period. The photographic portion of the mission ended on 18 August. The spacecraft took its first photograph of the moon at 6 August 7:22 AM EDT. The spacecraft acquired photographic data from 6-18 August 1967, and readout occurred until 27 August 1967. A total of 633 high resolution and 211 medium resolution frames at resolution down to 2 meters were acquired, bringing the cumulative photographic coverage by the 5 Lunar Orbiters to 99% of the Moon's surface. Accurate data were acquired from all other experiments throughout the mission. The spacecraft was tracked until it impacted the Lunar surface on command at 2.79 degrees S latitude, 83 degrees W longitude (selenographic coordinates) on 31 January 1968. The main bus of the Lunar Orbiter was approximately a truncated cone, 1.65 meters tall and 1.5 meters in diameter at the base. The spacecraft was comprised of three decks supported by trusses and an arch. The equipment deck at the base of the craft held the battery, transponder, flight progammer, inertial reference unit (IRU), Canopus star tracker, command decoder, multiplex encoder, traveling wave tube amplifier (TWTA), and the photographic system. Four solar panels were mounted to extend out from this deck with a total span across of 3.72 meters. Also extending from the base of the spacecraft were a high gain antenna on a 1.32 meter boom, and a low gain antenna on a 2.08 meter boom. Above the equipment deck, the middle deck held the velocity control engine, propellant, oxidizer and pressurization tanks, Sun sensors, and micrometeoroid detectors. The third deck consisted of a heat shield to protect the spacecraft from firing the velocity control engine. The nozzle of the engine protruded through the center of the shield. Mounted on the perimeter of the top deck were four attitude control thrusters. 375 W of power was provided by the four solar arrays containing 10,856 n/p solar cells, which could directly run the spacecraft and also charge the 12 amp-hr nickel-cadmium battery. The batteries were used during the brief periods of occultation when no solar power was available. Propulsion for major maneuvers was provided by the gimballed velocity control engine, a hypergolic 100-pound-thrust Marquardt rocket motor. Three-axis stabilization and attitude control were provided by four one-lb nitrogen gas jets. Navigational knowledge was provided by five Sun sensors, a Canopus star sensor, and the IRU equipped with internal gyros. Communications were via a 10 W transmitter and the directional 1 meter diameter high gain antenna for transmission of photographs and a 0.5 W transmitter and omnidirectional low gain antenna for other communications. Both antennas operated in the S-band at 2295 MHz. Thermal control was maintained by a multilayer aluminized mylar and dacron thermal blanket which enshrouded the main bus, special paint, insulation, and small heaters. The Lunar Orbiter program was managed by NASA Langley Research Center and consisted of building and launching 5 Lunar Orbiters which returned photography of 99% of the surface of the Moon (near and far side) with resolution down to 1 meter. Altogether, the Orbiters returned 2180 high resolution and 882 medium resolution frames. The micrometeoroid experiments recorded 22 impacts showing the average micrometeoroid flux near the Moon was about two orders of magnitude greater than in interplanetary space but slightly less than the near Earth environment. The radiation experiments confirmed that the design of Apollo hardware would protect the astronauts from average and greater-than-average short term exposure to solar particle events. The use of Lunar Orbiters for tracking to evaluate the Manned Space Flight Network tracking stations and Apollo Orbit Determination Program was successful, with three Lunar Orbiters (2, 3, and 5) being tracked simultaneously from August to October 1967. The Lunar Orbiters were all eventually commanded to crash on the Moon before their attitude control gas ran out so they would not present navigational or communications hazards to later Apollo flights. During the 6h 31m Skylab 3-1 EVA, astronauts Garriot and Lousma installed a second sunshade, and replaced solar camera film cartridges. USSR launched Cosmos 670 from Baikonur, an unmanned Soyuz 7K-S test flight which was recovered on 8 August at 23:59 GMT. Claes-Ingvar Lagerkvist discovered asteroid #2191 Uppsala. E. Bowell discovered asteroid #2570 Porphyro; Z. Vavrova discovered asteroids #2522, #2523 and #2544 Gubarev. NASA's STS 51-F (Challenger 8, 19th Shuttle mission) ended with a touchdown at Edwards Air Force Base, California, after carrying Spacelab 2 to orbit. The STS 51-F launch countdown on 12 July 1985 was halted at T-3 seconds when a malfunction of the number two main engine coolant valve caused a shutdown of all three main engines. The rescheduled launch on 29 July was delayed one hour 37 minutes due to problem with a table maintenance block update uplink. Five minutes, 45 seconds into the ascent, the number one main engine shut down prematurely due to a a sensor problem, and an abort-to-orbit trajectory was declared. Despite the the anomaly, which required mission replanning, the mission continued, and was eventually declared a success. The primary payload for STS 51-F was Spacelab 2, with 13 experiments in life sciences, plasma physics, astronomy, high-energy astrophysics, solar physics, atmospheric physics and technology research. A special part of the modular Spacelab system, the Igloo, located at head of the three pallet train, provided on-site support to instruments mounted on the other pallets. The main mission objective was to verify performance of the Spacelab systems, and to determine the interface capability of the orbiter, and to measure the environment induced by the spacecraft. The flight crew was divided into red and blue teams; the teams worked 12 hour shifts for continuous 24 hour/day operation. STS 51-F also carried the Plasma Diagnostics Package (PDP), which was released into an independent orbit on 1 August, and retrieved on 2 August. Other payloads carried on STS 51-F included the Shuttle Amateur Radio Experiment (SAREX) and the Protein Crystal Growth (PCG) experiment. The STS 51-F launch marked the first time carbonated beverages were carried into space. STS 51-F ended on 6 August 1985 when Challenger landed on revolution 127 on Runway 23, Edwards Air Force Base, California; the mission was extended 17 revolutions for additional payload activities due to the abort-to-orbit. Rollout distance: 8,569 feet. Rollout time: 55 seconds. Launch weight: 252,855 pounds. Landing weight: 204,169 pounds. Orbit altitude: 173 nautical miles. Orbit inclination: 49.5 degrees. Mission duration: seven days, 22 hours, 45 minutes, 26 seconds. Miles traveled: 3.3 million. The orbiter was returned to the Kennedy Space Center 11 August 1985. The flight crew for STS 51-F was: Gordon Fullerton, Commander; Roy D. Bridges Jr., Pilot; F. Story Musgrave, Mission Specialist 1; Anthony W. England, Mission Specialist 2; Karl G. Henize, Mission Specialist 3; Loren W. Acton, Payload Specialist 1; John-David F. Bartoe, Payload Specialist 2. Tim Berners-Lee posted a short summary of the World Wide Web project on the alt.hypertext newsgroup, and made the first website publicly available; it explained the World Wide Web and described how to use it. Russia launched Molniya 1-84 from Plesetsk for operation of the long-range telephone and telegraph radio communications system, and transmission of television programs to stations in the Orbita network. NASA announced that the ALH 84001 meteorite, thought to originate from Mars, contains evidence of primitive life-forms. Russia launched Progress M1-3 from Baikonur to the International Space Station (ISS). Russia launched Progress M1-3 on 6 August 2000. Progress M1-3 automatically docked with the International Space Station at 2013 GMT on 8 August at the rear Zvezda port. The supply ship began refuelling the station a few days later. It remained attached for offloading of its dry cargo by the STS 106 crew. It separated from Zvezda's rear port at 0405 GMT on 1 November 2000, and was deorbited over the Pacific at 0705 GMT. 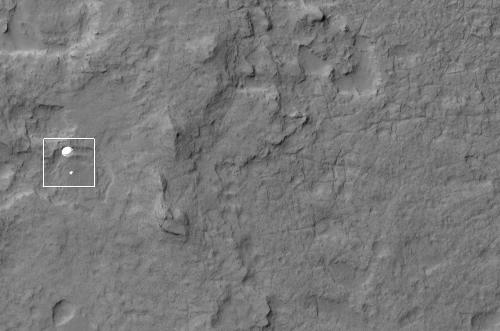 NASA's Mars Reconnaissance Orbiter passed over Gale crater and the HiRISE camera captured an image of the Curiosity rover descending with its backshell and supersonic parachute. NASA's Curiosity rover successfully landed on Mars. NASA's Mars Science Laboratory spacecraft launched from Cape Canaveral Air Force Station, Florida, at 15:02:00 UTC (10:02AM EST) on 26 November 2011. The spacecraft flight system had a launch mass of 3,893 kg (8,583 lb), consisting of an Earth-Mars fueled cruise stage (539 kg (1,188 lb)), the entry-descent-landing (EDL) system (2,401 kg (5,293 lb) including 390 kg (860 lb) of landing propellant), and an 899 kg (1,982 lb) mobile rover with an integrated instrument package. 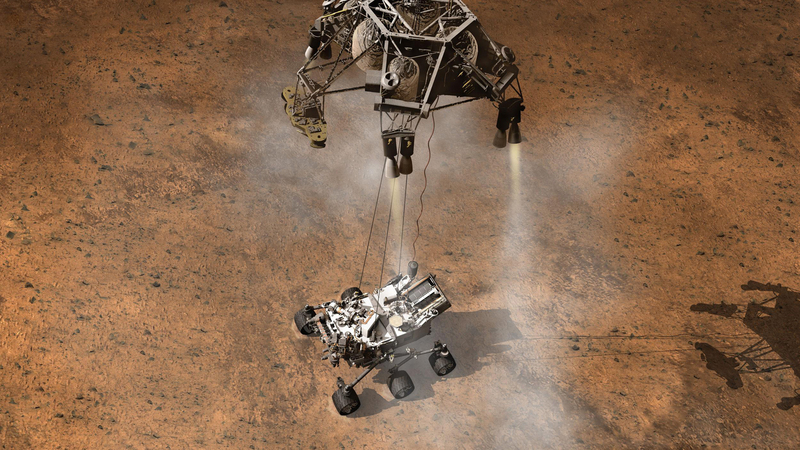 On 11 January 2012, the spacecraft successfully refined its trajectory with a three-hour series of thruster-engine firings, advancing the rover's landing time by about 14 hours. Selection of Gale Crater for the landing during preflight planning had followed consideration of more than thirty locations by more than 100 scientists participating in a series of open workshops. The selection process benefited from examining candidate sites with NASA's Mars Reconnaissance Orbiter and earlier orbiters, and from the rover mission's capability of landing within a target area only about 20 kilometers (12 miles) long. That precision, about a fivefold improvement on earlier Mars landings, made sites eligible that would otherwise be excluded for encompassing nearby unsuitable terrain. The Gale Crater landing site, about the size of Connecticut and Rhode Island combined, is so close to the crater wall and Mount Sharp that it would not have been considered safe if the mission were not using this improved precision. Science findings began months before landing as Curiosity made measurements of radiation levels during the flight from Earth to Mars that will help NASA design for astronaut safety on future human missions to Mars. The Mars rover Curiosity landed successfully on the floor of Gale Crater at 05:32 UTC on 6 August 2012, at 4.6 degrees south latitude, 137.4 degrees east longitude and minus 4,501 meters (2.8 miles) elevation. Engineers designed the spacecraft to steer itself during descent through Mars' atmosphere with a series of S-curve maneuvers similar to those used by astronauts piloting NASA space shuttles. During the three minutes before touchdown, the spacecraft slowed its descent with a parachute, then used retrorockets mounted around the rim of its upper stage. The parachute descent was observed by the Mars Reconnaissance Orbiter, see Wikipedia for the image and some notes. In the final seconds of the landing sequence, the upper stage acted as a sky crane, lowering the upright rover on a tether to land on its wheels. The touchdown site, Bradbury Landing, is near the foot of a layered mountain, Mount Sharp (Aeolis Mons). Curiosity landed on target and only 2.4 km (1.5 mi) from its center. Some low resolution Hazcam images were immediately sent to Earth by relay orbiters confirming the rover's wheels were deployed correctly and on the ground. Three hours later, the rover began transmitting detailed data on its systems' status as well as on its entry, descent and landing experience. On 8 August 2012, Mission Control began upgrading the rover's dual computers by deleting the entry-descent-landing software, then uploading and installing the surface operation software; the switchover was completed by 15 August. On 15 August, the rover began several days of instrument checks and mobility tests. The first laser test of the ChemCam on Mars was performed on a rock, N165 ("Coronation" rock), on 19 August. In the first few weeks after landing, images from the rover showed that Curiosity touched down right in an area where water once coursed vigorously over the surface. The evidence for stream flow was in rounded pebbles mixed with hardened sand in conglomerate rocks at and near the landing site. Analysis of Mars' atmospheric composition early in the mission provided evidence that the planet has lost much of its original atmosphere by a process favoring loss from the top of the atmosphere rather than interaction with the surface. In the initial months of the surface mission, the rover team drove Curiosity eastward toward an area of interest called "Glenelg," where three types of terrain intersect. The rover analyzed its first scoops of soil on the way to Glenelg. In the Glenelg area, it collected the first samples of material ever drilled from rocks on Mars. Analysis of the first drilled sample, from a rock target called "John Klein," provided the evidence of conditions favorable for life in Mars' early history: geological and mineralogical evidence for sustained liquid water, other key elemental ingredients for life, a chemical energy source, and water not too acidic or too salty. Within the first eight months of a planned 23-month primary mission, Curiosity met its major objective of finding evidence of a past environment well suited to supporting microbial life. On 6 August 2013, Curiosity audibly played "Happy Birthday to You" in honor of the one Earth year mark of its Martian landing. This was the first time that a song was played on a foreign planet; making "Happy Birthday" the first song and Curiosity the first device used to play music on a foreign planet. This was also the first time music was transmitted between two planets. On 24 June 2014, Curiosity completed a Martian year (687 Earth days) on Mars. On 26 September 2013, NASA scientists reported the Mars Curiosity rover detected "abundant, easily accessible" water (1.5 to 3 weight percent) in soil samples at the Rocknest region of Aeolis Palus in Gale Crater. On 3 June 2014, Curiosity observed the planet Mercury transiting the Sun, marking the first time a planetary transit has been observed from a celestial body besides Earth. For more information about the Curiosity rover and its continuing science experiments and discoveries, visit NASA's Mars Science Laboratory - Curiosity Web page or the JPL link below. Curiosity has a mass of 899 kg (1,982 lb) including 80 kg (180 lb) of scientific instruments, including equipment to gather and process samples of rocks and soil, distributing them to onboard test chambers inside analytical instruments. It inherited many design elements from previous rovers, including six-wheel drive, a rocker-bogie suspension system, and cameras mounted on a mast to help the mission's team on Earth select exploration targets and driving routes. The rover is 2.9 m (9.5 ft) long by 2.7 m (8.9 ft) wide by 2.2 m (7.2 ft) in height. NASA's Jet Propulsion Laboratory (JPL), Pasadena, California, builder of the Mars Science Laboratory, engineered Curiosity to roll over obstacles up to 65 centimeters (25 inches) high and to travel about 200 meters (660 feet) per day on Martian terrain at a rate up to 90 m (300 ft) per hour. Curiosity is powered by a radioisotope thermoelectric generator (RTG), producing electricity from the heat of plutonium-238's radioactive decay. The RTG gives the mission an operating lifespan on the surface of "a full Mars year (687 Earth days) or more." At launch, the generator provided about 110 watts of electrical power. Warm fluids heated by the generator's excess heat are plumbed throughout the rover to keep electronics and other systems at acceptable operating temperatures. Although the total power from the generator will decline over the course of the mission, it was still providing 105 or more watts a year after landing; it is expected to still be supplying 100 watts after ten years. Curiosity is equipped with several means of communication, an X band small deep space transponder for communication directly to Earth via NASA's Deep Space Network and a UHF Electra-Lite software-defined radio for communicating with Mars orbiters. The X-band system has one radio, with a 15 W power amplifier, and two antennas: a low-gain omnidirectional antenna that can communicate with Earth at very low data rates (15 bit/s at maximum range), regardless of rover orientation, and a high-gain antenna that can communicate at speeds up to 32 kbit/s, but must be aimed. The UHF system has two radios (approximately 9 W transmit power), sharing one omnidirectional antenna. This can communicate with the Mars Reconnaissance Orbiter (MRO) and Odyssey orbiter (ODY) at speeds up to 2 Mbit/s and 256 kbit/s, respectively, but each orbiter is only able to communicate with Curiosity for about 8 minutes per day. The orbiters have larger antennas and more powerful radios, and can relay data to earth faster than the rover could do directly. Therefore, most of the data returned by Curiosity is via the UHF relay links with MRO and ODY. The data return via the communication infrastructure as implemented at MDL, and the rate observed during the first 10 days was approximately 31 megabytes per day. In 2013, after the first year since Curiosity's landing, the orbiters had already downlinked 190 gigabits of data from Curiosity. Typically 225 kbit/day of commands are transmitted to the rover directly from Earth, at a data rate of 1–2 kbit/s, during a 15-minute (900 second) transmit window, while the larger volumes of data collected by the rover are returned via satellite relay. The one-way communication delay with Earth varies from 4 to 22 minutes, depending on the planets' relative positions. In April 2004, NASA solicited proposals for specific instruments and investigations to be carried by Mars Science Laboratory. The agency selected eight of the proposals later that year and also reached agreements with Russia and Spain to carry instruments those nations provided. Curiosity carries the most advanced payload of scientific gear ever used on Mars' surface, a payload more than 10 times as massive as those of earlier Mars rovers. More than 400 scientists from around the world participate in the science operations. A suite of instruments named Sample Analysis at Mars (SAM) analyzes samples of material collected and delivered by the rover's arm, plus atmospheric samples. It includes a gas chromatograph, a mass spectrometer and a tunable laser spectrometer with combined capabilities to identify a wide range of carbon-containing compounds and determine the ratios of different isotopes of key elements. Isotope ratios are clues to understanding the history of Mars' atmosphere and water. An X-ray diffraction and fluorescence instrument called CheMin also examines samples gathered by the robotic arm. It is designed to identify and quantify the minerals in rocks and soils, and to measure bulk composition. Mounted on the arm, the Mars Hand Lens Imager takes extreme close-up pictures of rocks, soil and, if present, ice, revealing details smaller than the width of a human hair. It can also focus on hard-to-reach objects more than an arm's length away and has taken images assembled into dramatic self-portraits of Curiosity. Also on the arm, the Alpha Particle X-ray Spectrometer determines the relative abundances of different elements in rocks and soils. The Mast Camera, mounted at about human-eye height, images the rover's surroundings in high-resolution stereo and color, with the capability to take and store high definition video sequences. It can also be used for viewing materials collected or treated by the arm. An instrument named ChemCam uses laser pulses to vaporize thin layers of material from Martian rocks or soil targets up to 7 meters (23 feet) away. It includes both a spectrometer to identify the types of atoms excited by the beam, and a telescope to capture detailed images of the area illuminated by the beam. The laser and telescope sit on the rover's mast and share with the Mast Camera the role of informing researchers' choices about which objects in the area make the best targets for approaching to examine with other instruments. The rover's Radiation Assessment Detector characterizes the radiation environment at the surface of Mars. This information is necessary for planning human exploration of Mars and is relevant to assessing the planet's ability to harbor life. In the two minutes before landing, the Mars Descent Imager captured color, high-definition video of the landing region to provide geological context for the investigations on the ground and to aid precise determination of the landing site. Pointed toward the ground, it can also be used for surface imaging as the rover explores. Spain's Ministry of Education and Science provided the Rover Environmental Monitoring Station to measure atmospheric pressure, temperature, humidity, winds, plus ultraviolet radiation levels. Russia's Federal Space Agency provided the Dynamic Albedo of Neutrons instrument to measure subsurface hydrogen up to 1 meter (3 feet) below the surface. Detections of hydrogen may indicate the presence of water bound in minerals. In addition to the science payload, equipment of the rover's engineering infrastructure contributes to scientific observations. Like the Mars Exploration Rovers, Curiosity has a stereo Navigation Camera on its mast and low-slung, stereo Hazard-Avoidance cameras. The wide view of the Navigation Camera is also used to aid targeting of other instruments and to survey the sky for clouds and dust. Equipment called the Sample Acquisition/Sample Preparation and Handling System includes tools to remove dust from rock surfaces, scoop up soil, drill into rocks to collect powdered samples from rocks' interiors, sort samples by particle size with sieves, and deliver samples to laboratory instruments. The Mars Science Laboratory Entry, Descent and Landing Instrument Suite was a set of engineering sensors that measured atmospheric conditions and performance of the spacecraft during the arrival-day plunge through the atmosphere, to aid in design of future missions. Curiosity touches down on Mars after being lowered by its Sky Crane. Curiosity played "Happy Birthday" for its one Earth year mark since landing, the first music transmitted between two planets, the first time a song was played on a foreign planet, making Curiosity the first device used to play music on another planet. ESA's Rosetta probe entered "orbit" around Comet 67P/Churyumov-Gerasimenko to begin a nominal 17 month study of the comet. Rosetta is European Space Agency (ESA) Horizon 2000 cornerstone mission number 3. It was designed to rendezvous with a comet, drop a probe on the surface, study the comet from orbit, and fly by at least one asteroid en route. The principal goals of the mission are to study the origin of comets, the relationship between cometary and interstellar material, and its implications with regard to the origin of the solar system. Its scientific objectives to achieve these goals are: global characterization of the nucleus, determination of dynamic properties, surface morphology and composition; determination of the chemical, mineralogical and isotopic compositions of volatiles and refractories in a cometary nucleus; determination of the physical properties and interrelation of volatiles and refractories in a cometary nucleus; study of the development of cometary activity and the processes in the surface layer of the nucleus and the inner coma (dust/gas interaction); global characterisation of asteroids, including determination of dynamic properties, surface morphology and composition. Rosetta's design is based on a box-shaped central frame, 2.8 m x 2.1 m x 2.0 m with an aluminum honeycomb main platform. The launch mass included the 100 kg lander and 165 kg of scientific instruments. Two solar panels, 32 square meters each, extend outward from opposite sides of the box, spanning 32 m tip-to-tip. The spacecraft consists of two primary modules, the Payload Support Module (PSM), which holds the scientific instrumentation and two payload boom deployment mechanisms in the top part of the frame, and the Bus Support Module (BSM), which holds the spacecraft subsystems in the lower part. A steerable 2.2 m diameter high-gain parabolic dish antenna is attached to one side, and the lander was mounted on the opposite side. The science instrument panel was mounted on the top and designed to be facing the comet continuously during orbit while the antenna and solar panels face the Earth and Sun. Radiators and louvers are mounted on the back and side panels which face away from the Sun and comet. In the center of the spacecraft protruding from the bottom is a vertical thrust tube made of corrugated aluminum with strengthening rings. The thrust tube provides the propulsion for primary maneuvers and contains two 1106-liter propellant tanks, the upper one containing propellant and the lower one oxidizer. A total of 660 kg of propellant (bipropellant monomethyl hydrazine) and 1060 kg of oxidizer (nitrogen tetroxide) was necessary to provide 2200 m/s delta-V over the course of the mission. The launch mass of the craft including fuel was 2900 kg. There are also four 35-liter pressurant tanks. The spacecraft is three-axis stabilized with orientation controlled by 24 10-N thrusters. Attitude is maintained using two star trackers, a Sun sensor, navigation cameras, and three laser gyro packages. Power is supplied by solar arrays composed of low intensity, low temperature solar cells. They provided 395 W at 5.2 AU and 850 W at 3.4 AU, when comet operations began. Power is stored in four 10 Ahr NiCd batteries which supply the 28 V bus power. Communications is via the high-gain antenna, a fixed 0.8 meter medium-gain antenna, and two omnidirectional low gain antennas. Rosetta utilizes an S-band command uplink and S- and X-band telemetry and science-data downlinks, with data transmission rates from 5 to 20 kbits/s. Communication equipment includes a 28 W RF X-band TWTA and a dual 5 watt RF S/X band transponder. On-board heaters kept the instrumentation from freezing during the period the spacecraft was far from the Sun. Total scientific payload mass is roughly 150 kg. The Rosetta lander, Philae, was attached to the side of the Rosetta spacecraft and is scheduled to be released in November 2014 for a landing on the comet nucleus. The scientific objectives are to determine the physical properties of the comet's surface and subsurface and their chemical, mineralogical and isotopic composition. This information will be used in tandem with the data returned by the Rosetta orbiter to characterize the comet. The Philae spacecraft is a partial hexagonal cylinder, approximately 1 meter across and 80 cm high, open on one end, supported on a long squat tripod and consists of a baseplate, experiment platform and hood. The structure is made of high modulus carbonfiber with an aluminum coating in a polygonal sandwich construction. The landing gear consists of a central telescopic tube connecting lift and torque mechanism located in the cavity of the lander's body connected at the lower end by a kardanic joint to the center of the tripod. The three lander legs are equipped with shock absorbers to inhibit bouncing in the low gravity. Push-down and hold-down thrusters are used to accelerate descent and impede rebound after touchdown. A harpoon connected to a tether will be fired into the surface of the comet to anchor the lander. Power will be provided by low intensity, low temperature GaAs solar cells mounted on the top panel of the lander hood and a 970 Whr and 110 Whr battery. The lander will communicate with the Rosetta spacecraft via a 1 W S-band transmitter. A flywheel provides 1-axis stabilization during the descent. The Philae surface science package, with a total mass of about 21 kg, includes an alpha-proton-X-ray spectrometer (APXS) to determine elemental composition; two gas chromatograph/mass spectrometers: the Cometary Sampling and Composition Experiment (COSAC) and Methods Of Determining and Understanding Light elements from Unequivocal Stable isotope compositions (MODULUS/Ptolemy) to study composition, isotopic abundances and to identify complex organic molecules in cometary material; Surface Electrical, Seismic, and Acoustic Monitoring Experiments (SESAME) to investigate surface material acoustically, measure dielectric properties of the environment, and monitor dust impacts; Multi-Purpose Sensors for Surface and Subsurface Science (MUPUS) to study physical properties of the comet; Comet Nucleus Sounding Experiment By Radiowave Transmission (CONSERT) to investigate electrical characteristics of the nucleus bulk material and internal structure; Rosetta Lander Magnetic field investigation and Plasma monitor (ROMAP) to investigate the comet's magnetic field and interaction with the solar wind; in-situ imaging systems known as Comet Nucleus Infrared and Visible Analyser (CIVA) and the Rosetta Lander Imaging System (ROLIS), and a drill and sample collector (SD2). Rosetta was launched at 07:17 UT on 2 March 2004 on an Ariane 5 G+ from Kourou, French Guiana. The spacecraft entered heliocentric orbit and had an Earth flyby and gravity assist on 4 March 2005. A Mars flyby/gravity assist followed on 25 February 2007, and two more Earth gravity assists on 13 November 2007 and 12 November 2009. As it approached Earth for its 2007 fly-by, the spacecraft was briefly designated as minor planet 2007 VN84 due to being misidentified as an asteroid. In between the Earth flybys, on 5 September 2008 at 18:58 UTC, Rosetta flew within 800 km of asteroid 2867 Steins at a relative velocity of 8.6 km/s. Steins is a main belt E-type asteroid 4.6 km in diameter. After the second Earth flyby the spacecraft entered the main asteroid belt for the second time and flew by asteroid 21 Lutetia at a distance of 3000 km and a speed of 15 km/s on 10 July 2010. Lutetia is a large asteroid, about 100 km in diameter. The spacecraft entered a a spin stabilised hibernation mode on 8 June 2011 where all electronics except the on-board computer and the hibernation heaters were switched off. On 20 January 2014 Rosetta came out of the 31 month hibernation. Starting on 7 May, it began its rendezvous manuever for Comet Churyumov-Gerasimenko. It arrived to "orbit" the comet on 6 August 2014 at 10:45-11:45 CEST. The rendezvous maneuver begun in May lowered the spacecraft velocity relative to that of the comet to roughly 25 m/s and put it into a near comet drift phase. Observations of the comet and the far approach trajectory phase followed. At the end of the ~90 day phase, the relative velocity between Rosetta and the comet was reduced to 2 m/s, at a distance of about 300 comet nucleus radii. At that point landmarks and radiometric measurements were used to make a precise determination of spacecraft and comet relative positions and velocities and the rotation and gravity of the comet nucleus to fine-tune the approach. The information was used to start orbit insertion at about 60 comet radii distance at a few cm/s. At about 25 comet radii a capture maneuver closed the orbit. Rosetta's initial path in the comet vicinity is a three-legged triangular "orbit" that requires a small thruster burn at each apex. The legs are about 100 km long and take between three and four days to complete each one. A video illustrating the maneuvers is available on YouTube. Polar orbits at 5 to 25 comet nucleus radii will be used for mapping the nucleus beginning in August 2014. After global studies of the nucleus are completed, about five areas (500 x 500 m) will be selected for close observation at a distance down to 1 nucleus radius. Using the information gathered from orbit, a landing site will be chosen for the Philae lander. Rosetta will go into an eccentric orbit with a pericenter as low as 1 km over the landing site and an ejection mechanism will separate Philae from the spacecraft with a maximum relative velocity up to 1.5 m/s in November 2014. The lander will touch down on the surface at a relative velocity of less than 1 m/s, and will transmit data from the surface to the spacecraft, which will relay it to Earth. Rosetta will remain in orbit about the comet past perihelion passage in August 2015 until the nominal end of mission in December 2015. On 11 November 2014, on confirmation that the orbiter is aligned correctly, Philae will be commanded to self-eject, unfold its three legs, and descend towards the surface from an altitude of roughly 1 km. The lander will touch down at less than 1 meter/sec, and the legs and thrusters will prevent the lander from bouncing. The legs can rotate, lift or tilt to return Philae to an upright position. Immediately after touchdown, a harpoon will be fired to anchor Philae to the ground and prevent it escaping from the comet's extremely weak gravity. After touchdown the lander will deploy its instruments. The minimum mission target is one week of operation on the surface, but operations of many months are possible. The Rosetta probe is named after the Rosetta Stone, a basalt slab of Egyptian origin featuring a decree in three scripts. Philae is named after an island in the river Nile on which an obelisk was found that had a bilingual inscription including the names of Cleopatra and Ptolemy in Egyptian hieroglyphs. This provided the French historian Jean-Francois Champollion with the final clues that enabled him to decipher the hieroglyphs of the Rosetta Stone and unlock the secrets of the civilisation of ancient Egypt. It is hoped that these spacecraft will result in better understanding of comets and the early Solar System. Rosetta was funded by the European Space Agency. The total cost of the mission, including launch and operation was about $900 million before the launch delay: The mission was originally set to be launched on 12 January 2003 to rendezvous with Comet 46 P/Wirtanen. Flybys of two asteroids, 4979 Otawara and 140 Siwa, on the way to the comet were also planned. However, this plan was abandoned after a failure of the Ariane 5 carrier rocket during a communications satellite launch on 11 December 2002, grounding it until the cause of the failure could be determined. The delay has reportedly cost an extra $70 to $80 million.